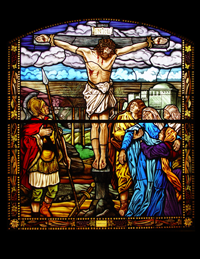 Classical narrative type stained glass windows typically depict biblical scenes or religious saints. The size of the painted scene can vary depending on the desired style and available budget for the windows. 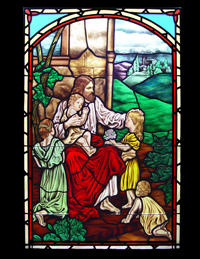 While most scenes are full-window, smaller scale depictions create medallion type features within more geometric overall windows. 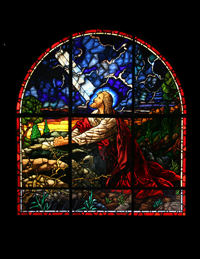 The cost of this type window is determined by the size of the painted scene and the intricacy of the geometric portion of the windows. Borders are typically painted to balance the amount of light transmission between the narrative scene and the border areas. These windows can feature memorial areas if so desired.